Eddie Jones’ men will have played over two months under the revised rules compared to Argentina, Australia and Samoa. Referee Wayne Barnes admits England will be looking to exploit the southern hemisphere’s unfamiliarity with the new laws being trialled in Europe. Argentina, Australia and Samoa visit Twickenham this autumn and along with their RBS 6 Nations counterparts, Eddie Jones’ men will have the benefit of spending over two months playing under the revised rules. Adjustments to the tackle and scrum laws are being trialled in the northern hemisphere this season and will not come into effect south of the equator until January. 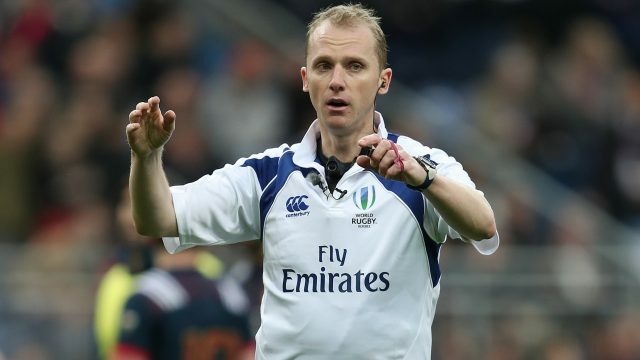 Barnes, Twickenham’s top official, will be among the referees who spend time with England in the build-up to the autumn to provide guidance over the way the game is officiated. “We all know that Eddie has a keen eye for detail and he will be keen for us to just add to that environment. Everyone will be looking for that competitive edge,” said Barnes. “Unfortunately for the southern hemisphere, but fortunately for us, come November they’ll be playing under our laws so they’ve got to get used to them. “The Lions hadn’t played under laws being trialled (on touch and end of game) in New Zealand during the summer so they got experts in to help them. I’m sure Australia and New Zealand will be doing the same. “New Zealand start with the Barbarians here which helps obviously. They’re the best players in world and the top six teams in the sport are playing each other. Increasing ball in play time means referees are fitter than players in the modern game, according to former Harlequins scrum-half turned official Karl Dickson. Dickson expects to oversee his first Aviva Premiership match this season after becoming the only former professional English player to make the transition. The 35-year-old was appointed to the Rugby Football Union’s panel of elite referees during the summer after three years of officiating outside the top tier on a part-time basis. The biggest shock to the system for a man who made 169 appearances for Harlequins was the new conditioning demands being made of him. “As a rugby player you’re doing big weights and running, whereas referees are doing weights to prevent injury and conditioning,” Dickson said. “Referees are a lot fitter than players, I can tell you that for a fact now. If you took us referees and put them against a load of players, we’d be way above them because it’s a different type of fitness. Previous articleEngland will be looking to beat the All Blacks and take over their No.1 spot!